Susan has created PowerPoint presentations to support the lessons from the Curriculum and incorporates videos and photos to visually stimulate her students. This is especially helpful for ELL students and students with special needs, she notes, but all students find it engaging. “Students have seen everything from videos of dogs with a talent for surfing, while learning to recognize their own talents; to a news video about how to read a dog’s body language, when learning how people also show feelings through their body language. There are so many ways to use dogs to help students connect to and understand the social skills taught within the Curriculum, and learning about dogs really helps hook the students and spark great conversations. There are so many connections that can be made between dogs and people within the themes and topics in this curriculum, and students can be easily guided toward making these connections. Once these connections are made, I have found that students are much more open and willing to discuss the topic at hand, and to share how they feel it applies to their own life,” she explains. This fall, Northaven Elementary hosted a Family Service Volunteer Day, which provided students, together with their families, a wonderful avenue to learn about and help Mutt-i-grees in their community. At the event, the school raised over $1,100 for their local animal shelter, an impressive feat considering the school’s demographics (over 70% free and reduced lunch). 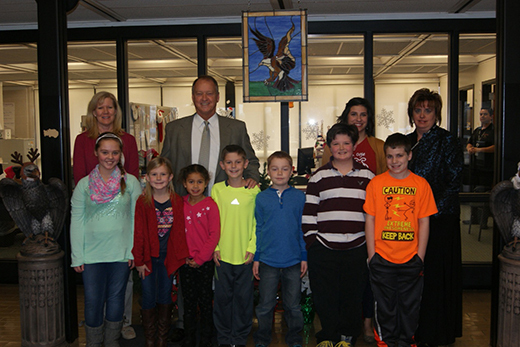 The students who received the top donations had their picture taken with Mayor Moore, which left a big impression on them. This personal visit to thank students sent a powerful message about just how important their contributions were. He praised the students for taking initiative to help their community, and encouraged other schools follow their lead.